Home > Research and Development > Research Updates > The impact of seed and soil health on potato productivity. A three-year Sustainable Farming Fund project investigated the impact of both soil physical structure and potato seed health on crop productivity and disease development. The study showed that potato crop performance can be negatively affected by poor soil structural conditions and the presence of seed and soil-borne diseases, and that these two main yield-limiting factors are often inextricably linked. The severity of these factors on yield and quality is in turn influenced by the cropping history of a field (for example, variations in cultivation intensity, soil organic matter levels, hosting of soil-borne disease), along with disease management of the preceding seed generations (including during crop growth, winter storage and handling). 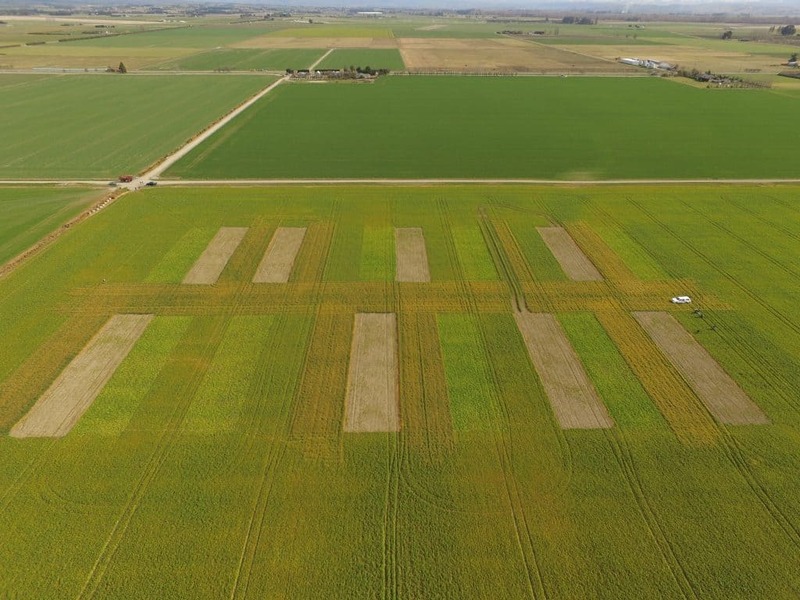 All 35 crops monitored in the first two years of this study exhibited rhizoctonia stem canker symptoms with potential to limit growth during the tuber bulking phase. This was especially true for the crops grown in poorly structured soils (19 fields) which also harboured other pathogens, particularly Spongospora (the pathogen causing powdery scab and root galls) (21 fields). The work showed that yield could be maximised by using whole seed (more vigorous than cut seed) and choosing fields with enhanced soil structure resulting from 7+ years of uninterrupted restorative crop growth (for example, grass). This was despite the continued presence of soil and seed-borne diseases, and the fact that pre-plant potato cultivation negatively affected some of the soil structural gains from the restorative grass phase. During the first and second years, the project also investigated the effectiveness of biofumigant crops for controlling soil-borne diseases in potato. Four replicated treatments of fallow, Caliente™ mustard, oats and radish were established in the autumn of 2015–16, before a spring potato crop (Figure 1). In late winter the crops were mulched and worked in, left to break down for three weeks before bed forming and potato planting. Soil-borne pathogen DNA amounts were measured before and after biofumigant crop growth. Plant health in each plot was monitored four times during crop growth, and yield measured at final harvest. Figure 1: Aerial view of the biofumigation trial (August 2016) just before mulching and incorporation. Radish and mustard breakdown resulted in elevated amounts of Rhizoctonia AG2.1 DNA in the soil, compared with pre-plant soil amounts. Brassicas are known hosts of rhizoctonia. Amounts of Rhizoctonia AG2.1 DNA in the soil were unchanged by the fallow and oat treatments. DNA amounts of all other measured pathogens did not change from pre-plant amounts. Rhizoctonia and spongospora disease severity and incidence in the following potato crop were similar (moderate to severe) for all biofumigant treatments, with no advantage over leaving the land fallow. Final potato yield did not differ amongst the treatments. Possible reasons for ineffective soil-borne disease control included insufficient biocidal activity from these winter-grown crops, loss of biocide to the atmosphere during incorporation, or the re-introduction of diseases via the planted potato (cut) seed. Work in the third year concentrated on seed health. 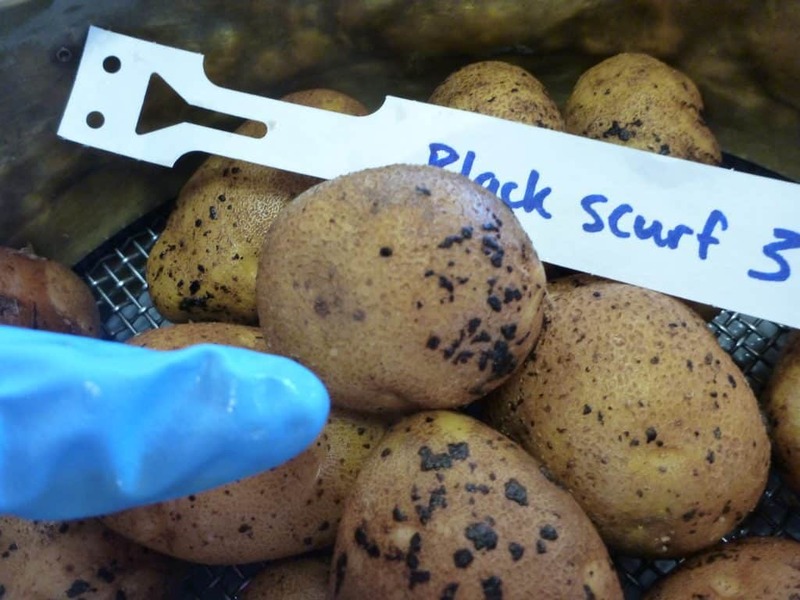 Firstly, a line of ‘Russet Burbank’ whole seed tubers was graded for visible rhizoctonia black scurf (the resting structure or sclerotia, which can later cause stem canker) severity, using a standardised scale of 0%, 5%, 20%, 46%, 60% black scurf coverage (Figure 2). The tubers were either dipped or not dipped in formalin solution, and then planted in pathogen-free growing medium in planter bags (10 replicates). The resulting rhizoctonia stem canker on the growing plants was just as severe for the 0% black scurf coverage treatment (treated and untreated with formalin) as it was for the other four severity categories (formalin treatment average), with formalin treatment reducing overall severity by 30% compared with that in the untreated controls. Implications are that the Rhizoctonia pathogen can be invisibly present on seed, or can spread from infected tubers in the same population, which can then result in severe stem canker infection of the following crop if conditions are favourable. Formalin seed treatment may be only partially effective at controlling this disease. Figure 2. Seed tubers with severe Rhizoctonia black scurf infection (~46% tuber coverage). Secondly, the health of seven commercial ‘Agria’ crops was monitored and compared with in-season health of their preceding seed lines (harvested as G4, 2016–17). The seed was also grown on as whole seed in sterile potting mix in a controlled, disease-inducing environment, to estimate the potential presence of seed-borne pathogens. Incidence and severity of rhizoctonia stem canker was low in the seed crops, low to moderate in the glasshouse plants, and low in all but one daughter commercial crop, this last having been subjected to drought and flood conditions (Manawatu) during growth. Spongospora root galling was scarce in the seed crops and daughter commercial crops (some were grown in ‘suppressive’ Pukekohe soils), but severe in the glasshouse plants, as this polycyclic pathogen multiplies rapidly in optimal conditions. These results show that if seed-borne inoculum can be minimised through the supply chain, the impact on well-managed crops can also be minimal. This project has shown that continued improvement of potato yields will be primarily dependent on planting healthy seed in fields with optimised soil physical (and microbiological) conditions. In future this may improve resource use efficiency (through enhanced root growth) and help to reduce dependence on pesticide use, given that more vigorously growing plants can mitigate the effects of disease. Soil physical structure is a key factor influencing crop productivity. Soil physical structure is a key factor influencing the development and expression of the two soil-borne diseases, powdery scab and rhizoctonia. In this trial, green manure/biofumigation crops had a limited impact on disease control and crop productivity. Seed-borne disease inoculum can affect the health of subsequent commercial crops, but this is highly influenced by soil-borne inoculum and in-season environmental factors. This research was funded by the Ministry for Primary Industries’ Sustainable Farming Fund (Project No. 408117, 2015-18).